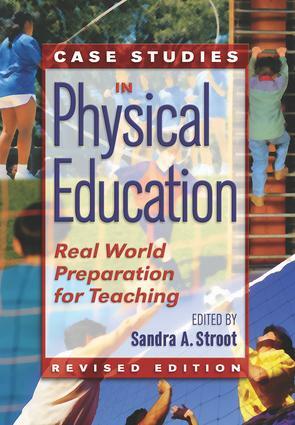 Case Studies in Physical Education, Revised Edition, applies the case study method to the field of physical education, where it is an effective means for future teachers to explore challenging scenarios that they are likely to encounter in their careers. These engaging, reader-friendly case studies provide readers with concrete suggestions for connecting classroom theory with what actually happens in school. Theories and concepts concerning educational philosophy, methodology, curriculum, discipline, and assessment become more meaningful when explored in a case scenario in which the central characters confront situations that develop as a consequence of their or others' pedagogical choices. The cases in this book also promote critical-thinking and problem-solving skills. Each case is followed by questions that prompt readers to analyze the situation, formulate a plan of action to address the problem, and anticipate and evaluate the potential consequences of the plan's implementation. In small groups, individually, or as a whole class, readers can explore and debate their strategies for addressing the issues. Readers will learn there is no one right answer to situations that can occur in the education environment. They will develop their communication skills as they learn to articulate and defend a plan of action to address the situation, and they will also learn the importance of collaborating with colleagues as they listen to and learn from the ideas of others. These cases were prepared by 36 experienced physical educators (from the elementary, secondary, and university levels)who collaborated in teams to create cases based on their collective, real-life experiences. As a result, the cases take place in a variety of contexts: in elementary, middle, and high schools; in urban, suburban, rural schools; and in wealthy and needy districts. They present a variety of issues encountered in schools today, including issues related to teaching methods, classroom management, multicultural education, classroom assessment, inclusion, relations with co-workers, marginalization of physical education, and gender equity. As in real life, each case raises a number of related issues that stimulate further discussion or provide opportunities for assignments. This revised edition contains the same proven, effective case studies as in the first edition while incorporating minor updating throughout to reflect changes in technology and society since its original publication. Case 10 Marginalization of P.E.